New screen life was given to the popular Azerbaijani movie "Arshin mal alan" (The Cloth Peddler) on the initiative and with support of the Heydar Aliyev Foundation, the Heydar Aliyev Center reported. The center will screen the colored version of restored movie on December 10. 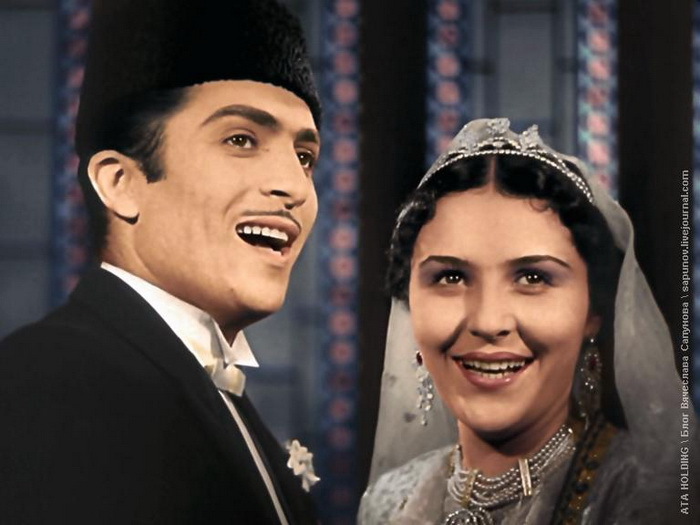 The film was shot in 1945 base on the same-name operetta of the author of the first Oriental opera Uzeyir Hajibeyli. "Arshin Mal Alan" operetta is the third and last operetta of Uzeyir Hajibeyli, the great Azerbaijani composer, and was composed and staged one century ago, in 1913, in Baku. Over 16 million viewers have seen the movie since its first release. Until today, the film "Arshin mal alan" was shown in 136 countries and dubbed in 86 languages. A number of versions of the movie have been made. The first versions, a silent comedy film, directed by Boris Svetlov appeared in 1917, the second black and white version, produced during the Soviet period, was directed by Reza Tahmasib and Nikolai Leshenko. This version is considered the most successful one. Famous singer Rashid Behbudov launched his acting career with this film starring as Askar. In 1965, a colored version of the film was directed by Tofig Taghizade. The movie satirizes social practices and traditions, particularly those related to the cumbersome practice of women wearing veils, and the consequences this practice had on the relationships between men and women. The plot is centered on a young man named Asker who wants to see and choose his bride himself before marriage. However, doing so was difficult at that time, because women were traditionally kept at home and were heavily covered in hijabs when they went outside. Asker's friend Suleyman suggests that he should dress up as a fabric peddler and go door-to-door, selling fabrics in order to meet women. Asker falls in love with Gulchohra and asks her father, the wealthy Sultan bey, for her hand in marriage. Sultan bey agrees, but Gulchohra objects, because she is in love with the peddler. Eventually, she realizes that the rich businessman Asker is actually her beloved peddler and they get married.